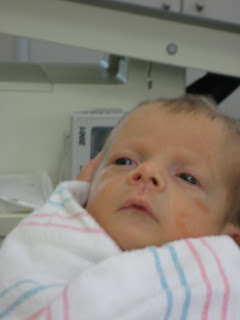 We made it back to the NICU today to see Noah & Finn. Even though it has only been a few days since we've been there, it is kind of strange to be back there, especially since we already have two at home. Hopefully, the video below works - this is my 1st time to try video. If it goes well I will start posting more videos. Noah is looking much better today. He has good coloring and appears more alert. He has also gained some weight back and is now 5#, thanks in part to being back on lipids and the new Elicare formula to help him process fat and protein. The plan is for the surgical team to assess him in about a week and a half to determine if he is ready to be re-connected (intestines sewn back together). They usually do this surgery 6-8 weeks after the first one. Finn is doing better as well. 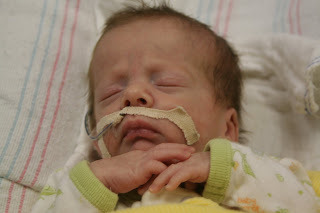 He does not de-sat (drop oxygen level) except after taking about 3/4 of his bottle, but the oxygen levels come back up sometimes on their own and sometimes with a little oxygen. He, too, is growing like crazy is next in line to come home. I imagine he feels lonely now without Cohen & Sophia by his side. Thankfully, Mari's parents made into town and took care of Cohen and Sophia for us. Cohen and Sophia go to christen their swings - not like that, they haven't pee-ed on them yet. Cohen has officially grown out of his preemie clothes; trying to put those on him reminded me of that scene in Black Sheep with Chris Farley when he is on the airplane and gets the life vest stuck around his neck. It seems like he could eat constantly all day long. Sophia seems to be going through a growth spurt right now. She has almost doubled the amount she eats. She is closing in on the 5.5 lb mark and will probably be there before Monday. It was so funny to her and Cohen in their swings because their eyes would go side to side with the swing. I tried to get video of it but you can't really tell what's going on. 9 months ago when we found out we were having quads, we were so stressed about the financial burden of raising 4 babies, especially as we went to one salary. We have been so blessed with God's grace and miracles; now we see that it is all so worth it and we don't even think about the medical expenses or any of that stuff. God has really taught us what is important. 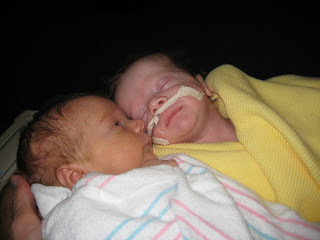 So happy to hear about the progress of all the babies, but especially good to hear that Noah and Finn are doing better. Every time I see the pictures (and now video) I rejoice in the wonderful gifts they are and how amazing the work of God is in our lives. 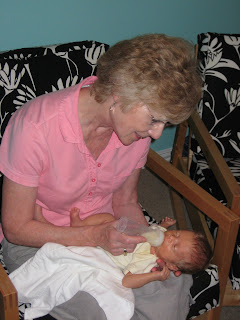 Enjoy all that grandparent help! 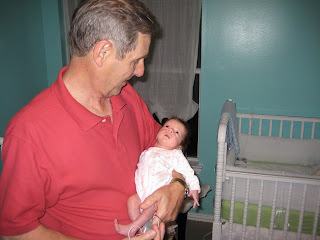 Philippians 4:19 "But my God shall supply all your needs...."
Amen in rejoicing on the wonderful gifts yhour babies are. I am so glad to hear and see that both Finn and Noah are doing better - and yes, their coloring is good. I loved it in the video when one turned toward the other - the babies will have such incredible bonding with each other. The video was so cute! I hope to see more soon! God has blessed not only your family, but all of us who have the opportunity to share this experience with you. Thank you so much for sharing your journey! We're so happy to see all of the kids are doing so well. Tim & Dawn look like they are very proud grandparents, too! You all continue to be in our prayers!